A series of short stories, almost entirely without words, show off the creative range of Jed Alexander in this small but enjoyable collection. Originally a Kickstarter project, Alexander came up with the idea of collecting his stories together after being asked to do so enough times that it made sense. "I can't make a hand bound book for everybody," he noted in the Kickstarter. Instead, there's now a version anyone can publish, and it's definitely a visual treat for fans of comics that lean more heavily on their visual rather than script sides. The collection opens with "Ella and the Pirates," a story of three kids who use their vivid imagination to turn an ordinary wagon into a sailing ship and go after buried treasure. Switching onto to reality as the framing device, the story features Ella taking the leading role, dueling her friend-as-pirate and generally protecting the other male character. That's so rare as to be notable. The images shift across the page without panels, drifting naturally into one another. It's a tale of wonder and imagination, captured for the reader, and it's no wonder folks were asking Alexander for copies. It's a great set piece. The rest of the stories are much shorter, and cover a range of topics. "Midnight Snack," which is narrated, is the story of a man's nose and moustache, who grow rather creepy, hairy legs and take off for parts unknown. "Rainy Day" features a boy and his umbrella and was used for the cover image. 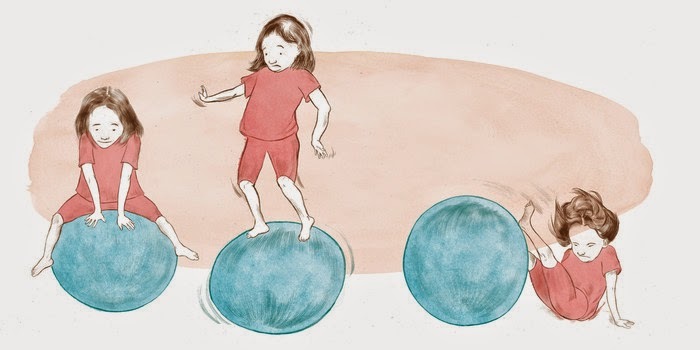 "The Dancer" is a young girl in a ballerina costume practicing, while "Girl Meets Ball" is exactly what you'd think. In two more shorts, a girl tries on different Halloween costumes. An adaptation of "Jack Be Nimble" closes out the book, with a mouse taking the role of the titular character, dressed in a marathon outfit and comically stretching before making the jump. It's a nice set up for a visual gag, and a great way to wrap things up. While researching for this review, I discovered that Alexander works in what he calls a "dry brush technique" which explains why my initial thoughts on this was that it was done with watercolors but couldn't figure out why that didn't seem quite right. The effect is a cross between the look of a watercolored work and something filled in with market, and I quite like the way it looks on the page. It allows for texturing, especially in the backgrounds, but there's a much richer depth to the color without water bleeding out some of the vibrancy from darker blues, greens, and reds. It also allows for more control and no bleed. That's a good thing, because Alexander's lines are extremely thin, which means there's no a lot of room for spillover. His work overall has the feel of children's book illustrations, and the subjects chosen here fit well with that aesthetic. (Mostly) Wordless probably hews closer to an art book than a traditional comic, but it's definitely pretty and thanks to the art style, features a unique look that was unfamiliar to me. I'm glad I encountered it. If you're a fan of comic-as-artform, seek this out. I think you'll like what you see. 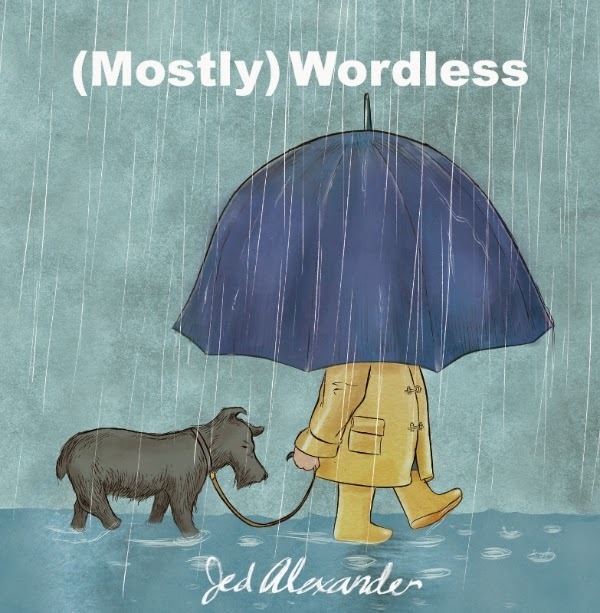 You can get a copy of (Mostly) Wordless directly from Alternative Comics.